These quick to make bags were originally made to give as gift to friends who were looking for something to take their mind off smoking. 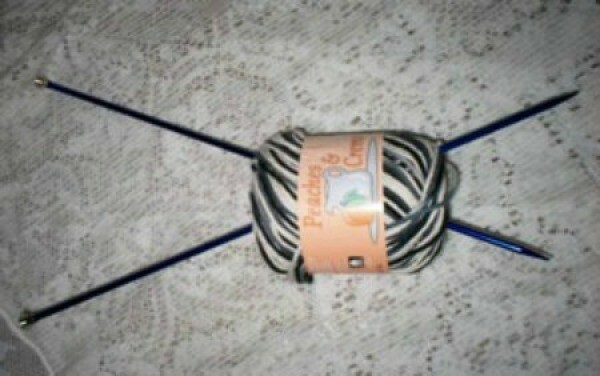 Add some knitting needles and yarn and they can make more to gift to other friends. This is a guide about how to make knit therapy bags. Several of my friends have recently quit smoking and wondered what to do with their hands when the urge to light up comes, so I began making "Knit Therapy Bags" to give to them. I knit an 18 inch square of yarn, then folded the square up, envelope-style. Then I sewed the sides of the bag shut with ordinary needle and thread and added a trim of ribbon and an antique button, using a glue gun. (The bag in the picture has a handle made from twine with a lime-green drinking straw, snipped into pieces, tied along the top). 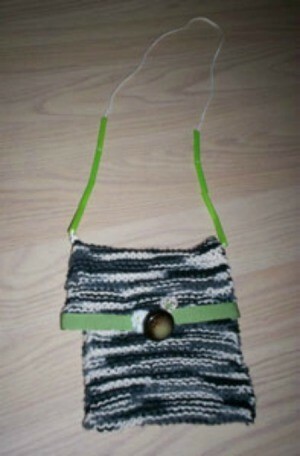 Inside the bags, I put a skein of yarn and knitting needles. The bags are a tongue-in-cheek reminder that you don't have to follow a pattern or have a set of rules to enjoy crafting, and that even a "knitwit" can make a unique statement with their hands. In our area, we have knitting circles where people will knit hats for newborns, or winter wear for the homeless and less fortunate. When you're between projects, it's nice to do something simple and quick for others. This is a wonderful idea. I think I would even put a laminated sheet in there showing how to cast on and the garter stitch just in case you have a friend who doesn't know how to knit!